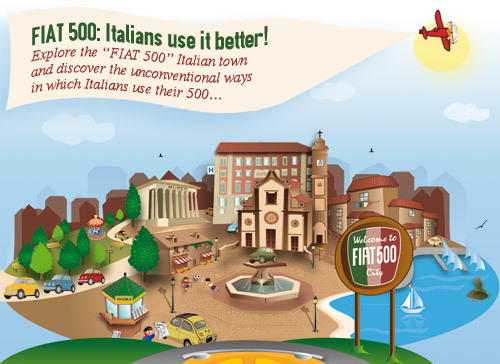 Welcome to the FIAT 500 Italian City - Play the game! FIAT 500 GAME: Italians use it better! There is an unmistakable thread that links Italian matters: that is creativity. Since 1957 there is a single object that embodies the Italian Style: that is the FIAT 500. And there is a lot of creativity in the way Italians use these 3 meters of perfection. More than a car, the FIAT 500 was born as a cheap city car, but it has rapidly become an Italian Myth, able to combine Style and Folk. In a few words: you can drive it, you should live it! Driven by our passion for the most popular Italian city car in the world, we have realized a collection of samples of the weirdest uses of this Italian Symbol. But that was not enough! This time we have decided to have fun: not a photo gallery or one of our beloved infographics. This time we have brought back the FIAT 500 to its natural habitat, placing the best specimens in the Italian jungle. Explore the FIAT 500 Italian City and discover the unconventional ways in which Italians use their old and new FIAT 500. Either you will be able to visit Italy this summer or not, have a stroll in our FIAT 500 City and discover the Italian Way! Stay tuned and do not miss our next works!